Two “Frog Ponds” Later, I Have It! 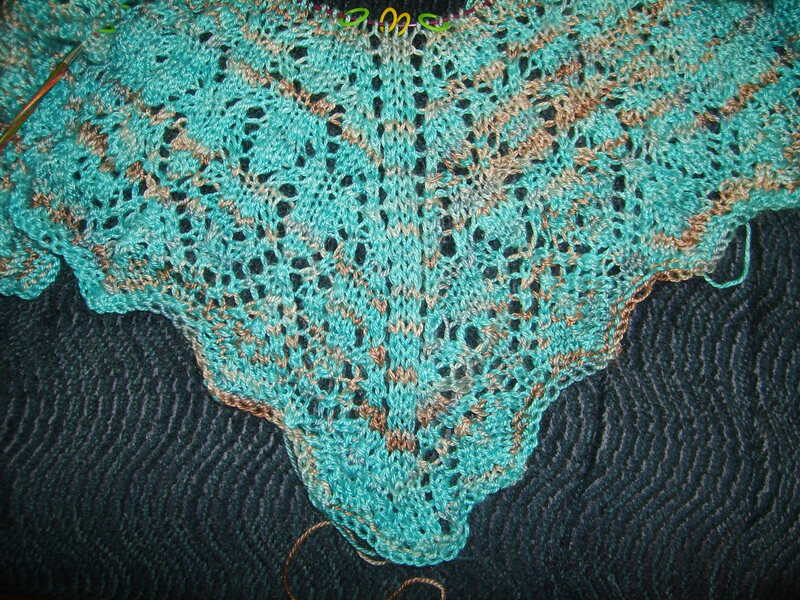 I am participating in Wendy Knits Summer Mystery Shawlette Knit-A-Long. I’m joining my longtime best friend, Lisa B., who is also working on her mystery shawl. I started out with a totally different yarn; knit for a few rows, then took it to my Tuesday Night Knitters Group for inspection, inspiration, advice, and just plain help. The result of that was to frog the first yarn because even though it was a cotton-blend (Misti Alpaca Pima Cotton & Silk DK), I was afraid there was too much cotton it in and the shawl would not drape correctly. I searched my stash of sock yarn, but nothing seemed to fit, so I decided to frog my Traveling By the Sea (post about it on April 21, 2011). This is the Traveling Woman pattern on Ravelry Shawlette. I liked the pattern, but I didn’t like the way it looked with the beautiful Handmaiden Fine Yarn Swiss Mountain Sea Sock yarn. I am now on Chart C and have just finished the first repeat of this 24-row chart. I have 2 more repeats to go. Thus, my title of “two frog ponds later!! !” I am liking the look of this shawl. What do you think?